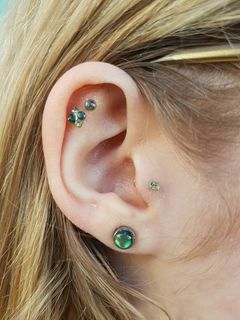 includes helix, industrial/scaffold, rook, daith, orbital, conch, anti-tragus, tragus, vertical lobe, and multiple point ear projects. includes bridge, eyebrow, nostril and septum. 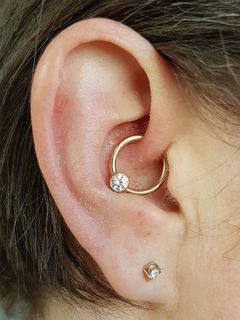 includes multiple ear piercings performed at ninjaflower to create a unique collection of piercings curated to suit the clients anatomy. includes beauty mark, cheek, labret, lip, philtrum, tongue and vertical labret. includes dermal anchors surface and navel piercings.